The Tecan Infinite M1000 Pro Multi Detection Plate Reader provides a powerful and accurate microplate reading that’s adaptable to fit your workflow. This monochromator-based microplate reader allows users to accommodate a wide range of applications, with modular features and a broad range of supported sample formats. The Infinite M1000 Pro uses a powerful Quad4 Monochromators technology that allows users freedom of choice in wavelength without the need for filters, from NIR to UV. The 4-channel, 2 excitation and 2 emission, absorbance optics, when partnered with the fast scan mode can return results for 1nm resolution across 384 probes in as little as 20 minutes. The flexibility of wavelength selection of this plate reader also means faster fluorescence excitation and emission scans. Thanks to the temperature correction function of this microplate reader, the Infinite M1000 Pro also enables Alpha Screen and AlphaLISA measurements. The Tecan Infinite M1000 Pro Multi Detection Plate Reader will support plates from 6-1536 wells in size, as well as Nano-quant plates for fast DNA quantification of up to 16 samples simultaneously in 2 µl drops. This microplate reader is also optimized for Z focus to improve the quality of measurements, even with low sample volumes. This adaptable plate reader is a great choice for labs that want to stay current without needing to continually invest in new instruments to run the latest assay. The flexibility of the M1000 Pro means it’s great for applications such as biomolecular screening, enzymatic assays (including kinase and protease assays), G protein coupled receptor (GPCR) assays, receptor-ligand binding studies and other molecular interaction assays. This highly accurate Tecan Microplate reader, will rise to meet your needs with adjustable bandwidth, for fine adjustments, quick start and stop pre programmed work flows, and the ability to choose either high speed or high sensitivity. The Tecan Infinite M1000 Pro Multi Detection Plate Reader also features powerful control software to help refine protocols, create fully customized applications, and export data. The Magellan software for the Tecan M1000 Pro provides users with a wizard guided interface, helps your lab to stay 21 CFR part 11 Compliant, and to process data in a way that’s optimized and flexible. The Tecan Infinite M1000 Pro has temperature control with a temperature range of 4-42°C, shaking in linear, orbital and double orbital motions with variable amplitudes, and comes with the optional barcode scanner. 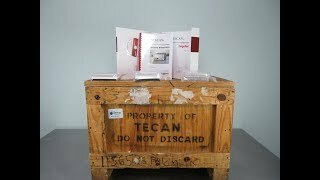 This Tecan Infinite M1000 Pro Multi Detection Plate Reader is new in the crate and has been fully inspected for functionality. The M1000 Pro comes with current validation reports and clean bills of health. All of our lab equipment comes backed with our standard warranty. Should you have any questions, please don't hesitate to contact us.